Caps Lock is a keyboard button that sets an input mode in which all typed letter are uppercase (capital) by default. As a rule, typing messages in all caps is considered the online equivalent of shouting. Netiquette typically discourages the use of caps lock when typing messages online, as it is considered rude. 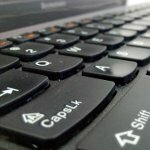 International Caps Lock Day was created in 2000 by Derek Arnold, a user on the community weblog MetaFilter. It was designed as a parody holiday to make fun of those who overuse the Caps Lock button and drive other users crazy. A second Caps Lock Day was instituted in 2009. It is celebrated on June 28 to commemorate the death anniversary of Billy Mays, an American infomercial icon and remarkably loud pitch-man. Mays always sounded like he was talking in all caps. On Caps Lock Day, you can let go and post messages IN ALL CAPS. You can even add an exclamation point at the end of each sentence for good measure, just to make sure you are heard... or read, whatever. And don't forget to spread the word about the holiday via social media.